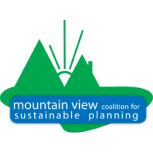 The Mountain View Coalition for Sustainable Planning is a local group comprised of resident volunteers dedicated to promoting environmentally friendly, socially-equitable development that helps realize a Mountain View that is beautiful, economically healthy, transit, bicycle, and pedestrian accessible, and affordable to all. We meet on the second Thursday of every month (with some occasional exceptions) from 6:30-8:30 PM Check our CALENDAR to find out about our next meeting and other events of interest. If you would like to participate or learn more, please email us at mvcsp.info@gmail.com. Please let us know what you would like to do personally through MVCSP. This will help us determine the kind of information to share with you.